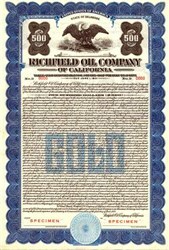 Beautifully engraved RARE SPECIMEN certificate from the Richfield Oil Company of California printed in 1928. This historic document was printed by the Jeffries Banknote Company and has an ornate border around it with a vignette of an eagle. Atlantic Richfield ( Arco ) was formed in 1966 from the merger of Richfield Oil Corporation and Atlantic Refining Company. Atlantic Refining had been incorporated in 1870 and was one of the Rockefeller companies until the Standard Oil Group was dissolved in 1911. Richfield Oil was founded in 1905. 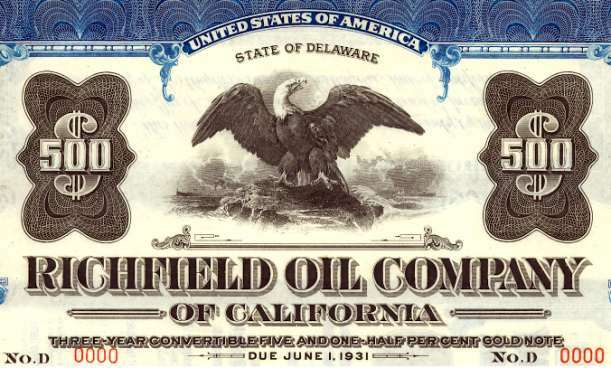 Richfield Oil company was based in Los Angeles. Arco was purchased by British Petroleum ( BP ) in 2000.